You probably know that staying active through regular exercise is vital to a healthy lifestyle. Exercise keeps your energy levels high, eases the daily pain, gets your blood flowing and can even improve your mood. However, there’s another very important reason to get moving: certain exercises can decrease your risk of a debilitating fall. Falls are the leading cause of both fatal and nonfatal injuries for older adults. In fact, one in four Americans age 65 and up fall every year, and over 95 percent of hip fractures are caused by falls. Additionally, after you break your hip, your chances of falling again increase by 53 percent. You might fall because you are experiencing side effects from certain medications you’re taking, or perhaps you can’t see as well as you used to. Home hazards like loose wires or throw rugs are often to blame for falls, too. Or, it might be that your bones and muscles have weakened over the years, and your reduced strength makes you more susceptible to slipping or tripping. As you age, the systems of your body that detect gravity and body positioning can become less effective, too. You can see why keeping your body strong as you age is so important to maintaining your overall health and safety. 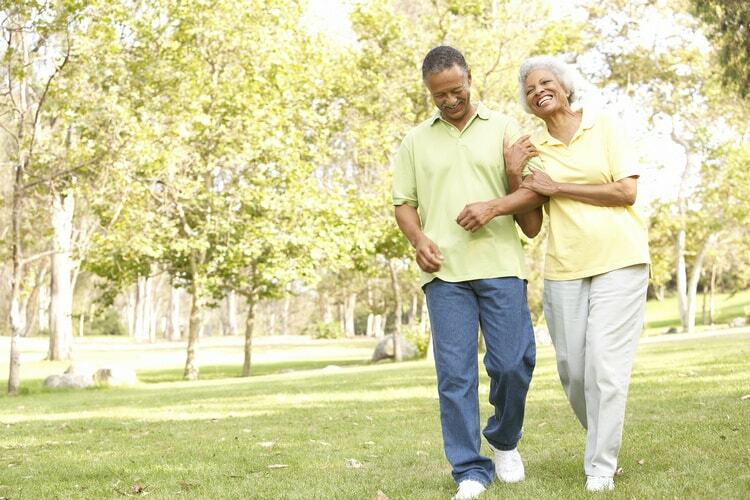 The good news is that it’s never too late to improve your balance and reduce your risk of a fall. Adding a few balance exercises that can be done out of the comfort of your home, with little to no equipment, will enhance your physical coordination and decrease your chances of falling. If you’re just starting out, make sure to contact your doctor to discuss any limitations you might have. You should also be sure to mention if you’ve fallen previously, as half of all seniors who fall fail to tell their doctor this important fact. This could mean that injuries went untreated and your balance could be worse than the doctor knows. Keep yourself safe by following any instructions or advice your doctor may give you. Before beginning any exercise, make sure to do a brief warmup to loosen your joints and prepare your muscles for activity. Your warmup should include some light stretches and marching in place to elevate your heart rate gradually. Stand on one foot or “flamingo pose.” Holding the back of a sturdy chair for support and balance, lift one foot and hold the position for ten seconds. Complete 10 to 15 repetitions on one leg, then switch to your other leg. Try holding the position for longer lengths of time as you gain more stability. Ultimately, your goal will be to let go of the back of the chair and cross your arms over your chest as you stand on one foot. Toe lifts. Stand tall and extend your arms in front of you, placing your hands lightly on the back of a sturdy chair or a countertop. Lift up on your toes as high as you can, then slowly lower back down. Try this for 20 repetitions. Heel-to-toe walk. For extra support, if you’re trying this balance exercise for the first time, follow the length of a wall. Place your hand lightly on the wall and step forward with your right foot, shifting your weight forward and placing your left foot directly in front of your right. The heel of your left foot should touch the toes on your right foot. Repeat this for 20 steps. As you progress with this exercise, try it going backward and forwards. Stand-to-sit. This is another balance exercise that will require a sturdy chair. Start by standing tall with your back to the chair, keeping your feet about hip-width apart. Slowly lower your hips onto the chair as gently as possible, pausing for a moment before pushing through your heels to rise back up to a standing position. You can hold on to a wall for support, but your goal should be to complete this exercise without the need to hold on to anything. Side and back leg raises. Stand behind a chair for support. For side leg raises, stand with your legs slightly apart, lifting one leg out to the side while keeping your back straight and your toes pointing forward. Hold for a second, lower your leg and repeat on the opposite side for 15 repetitions. For back leg raises, slowly lift one leg straight behind you without bending your knee. Hold for a second or two, then lower your leg. Repeat on the opposite side and do about 15 reps on each. These are great exercises that not only help your balance, but they can build more strength and muscle, too. At Peabody Retirement Community, you’ll enjoy countless opportunities to improve your balance and fitness at the Billie Jane Strauss Wellness Center. Test your balance on the Biodex Balance System® SD to pinpoint your individual risk factors, then allow our staff to tailor a personalized program to decrease that risk and improve your balance. Our best-in-class fitness center provides one-on-one attention from a personal trainer and plenty of classes that improve all eight dimensions of wellness. Please contact us today to learn more about our vibrant senior living community in North Manchester, Indiana.